Hybrid molecule approach of drug design has become popular due to advantages such as delayed resistance, reduced toxicity, ease of treatment of co-infection and lower cost of preclinical evaluation. Antifungal drugs currently available for the treatment of fungal diseases suffer a major side effect of drug resistance. Hybrid drugs development is one of the approaches that has been employed to control microbial resistance. Their antifungal activity is influenced by their design. This review is focused on hybrid molecules exhibiting antifungal properties to guide scientists in search of more efficient drugs for the treatment of fungal diseases. Keywords: Heterocyclic compounds, hybrid compounds, antifungal, co-infection, preclinical evaluation, fungal diseases. Keywords:Heterocyclic compounds, hybrid compounds, antifungal, co-infection, preclinical evaluation, fungal diseases. Abstract:Hybrid molecule approach of drug design has become popular due to advantages such as delayed resistance, reduced toxicity, ease of treatment of co-infection and lower cost of preclinical evaluation. Antifungal drugs currently available for the treatment of fungal diseases suffer a major side effect of drug resistance. Hybrid drugs development is one of the approaches that has been employed to control microbial resistance. Their antifungal activity is influenced by their design. 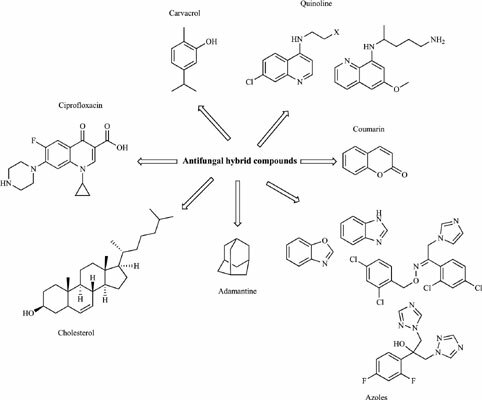 This review is focused on hybrid molecules exhibiting antifungal properties to guide scientists in search of more efficient drugs for the treatment of fungal diseases.